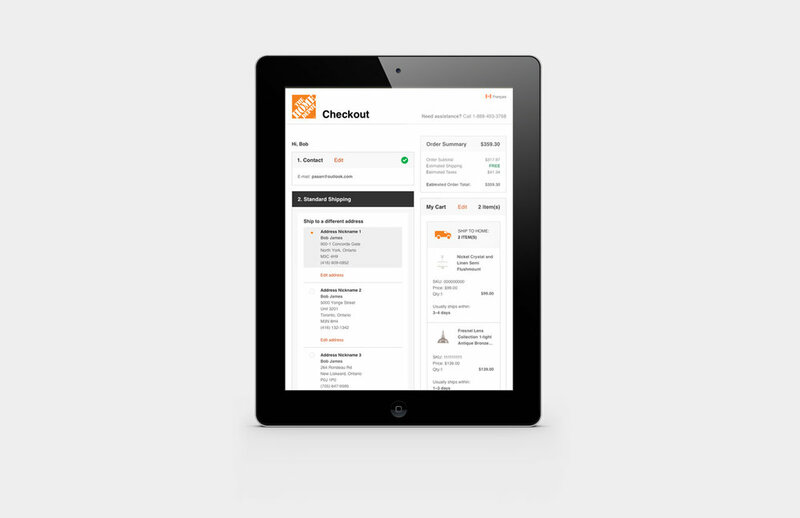 A redesign of a whole new checkout experience for The Home Depot Canada. 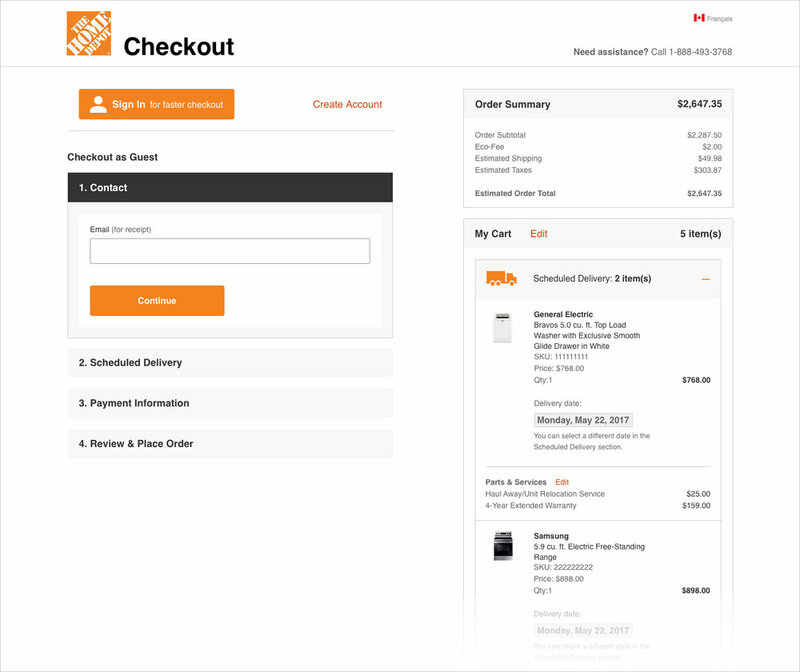 The current Home Depot Canada's checkout experience is extremely cumbersome in nature as customers had to go through a multi-step process to checkout products, which resulted in a huge drop off rate. 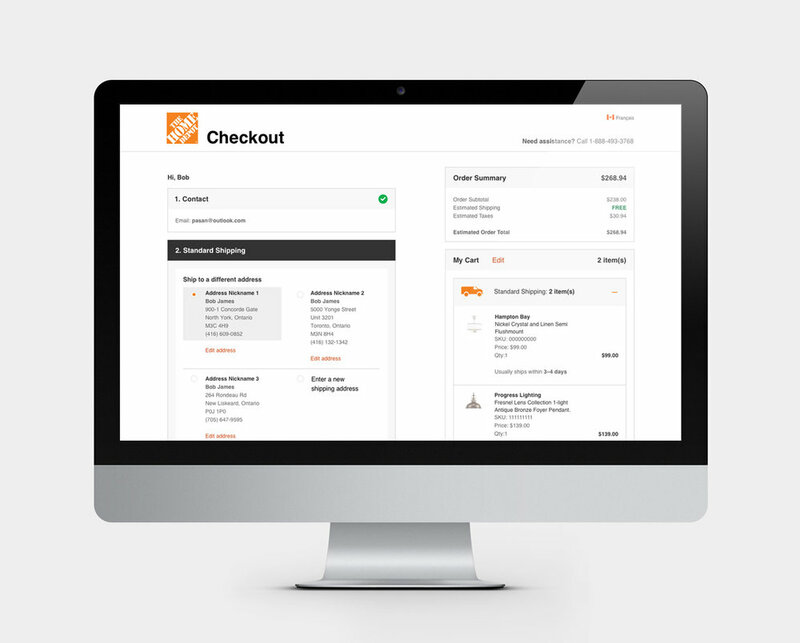 The redesign was an initiative led by the Product and UX Strategy teams in the E-Commerce department of The Home Depot Canada. I worked in conjunction with the Online Experience Analyst as well as the Analytics Lead to gain more insights as to how customers checkout their items from either the Cart or Add to Cart (ATC) Overlay. Where Are We Losing Our Users? While collaborating with the Analytics Lead, we found out that that there were huge drop off points in the current checkout flow as seen above. After retrieving the metrics mentioned above, with the aid of the UX Strategist, I created a few user flows that outlined the various scenarios that can occur within the current/existing state of the checkout experience of various scenarios to gain more insight. 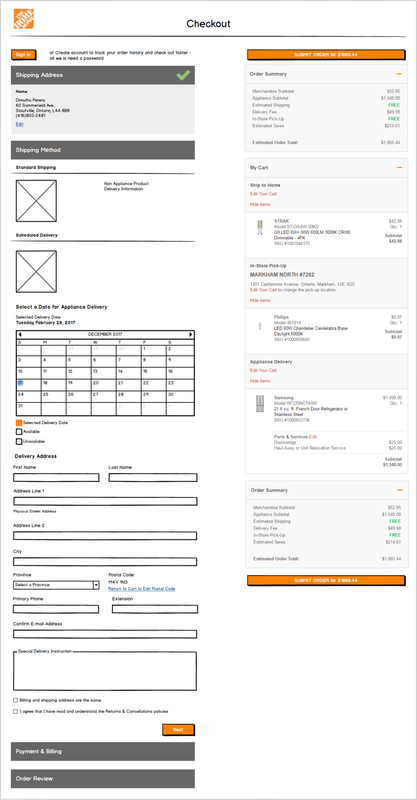 Indigo has its checkout experience as a one pager encompassing an accordion UI pattern. This provides an easier experience for the customer to checkout their items. Home Depot (USA) has its checkout as a one pager as well. It is being served up for all scenarios such as standard shipping, BOPIS, appliance checkout, etc. The user base had already been defined in the discovery phase of the checkout application when it first launched a few years ago. Hence, this step wasn't required. As part of the cross collaboration efforts between different teams when it comes to large projects, I collaborated with my Lead UX Designer, Zaki Hassan, to focus on prototyping the key features I mentioned above, in the interactive prototype below. 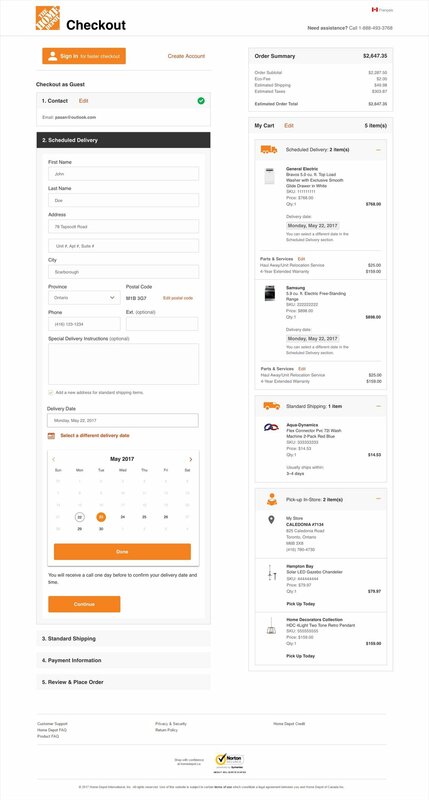 I strongly pushed forward to the Product Owner that the prototypes needed to be tested for usability before visual design to ensure if the one page design actually works for Home Depot customers. 1) It was not clear to users that the checkout is initially a Guest Checkout; they thought that the initial form fields for E-Mail and Name are for signing in. Perhaps the Sign In and Create Account CTAs are confusing to them as they are above? - Do we need the Name (First & Last) as we are asking these in Billing? - Can we distinguish somehow this is a Guest Checkout? - Can we note that the e-mail is for receipt? Due to a tight timeline of meeting IT's development sprint, I took all of these insights and made my way towards the visual design stage. When it came to visual design, I went with a clean, flat style overall, ensuring that all typography and colors being used adhere to Home Depot Canada's style guide as well as WCAG 2.0/AODA guidelines. Since the application is very content heavy at this point, I played around with visual hierarchy in terms of typographic treatment, color, images and icons. The icons I designed truly helps in identifying the specific products that are being scheduled for delivery or for standard shipping. Product images and their respective names/brand names are emphasized here to ensure user affirmation as well as their respective fulfillment options. Spacing between elements was hugely taken into consideration in order to accommodate mobile tap target areas and to create visual hierarchy. This was a complicated scenario as there were a couple of features (Scheduled Delivery Information, Delivery Date Picker, delivery dates of appliances in the cart section, Parts & Services to name a few) that needed to be showcased to the customer. 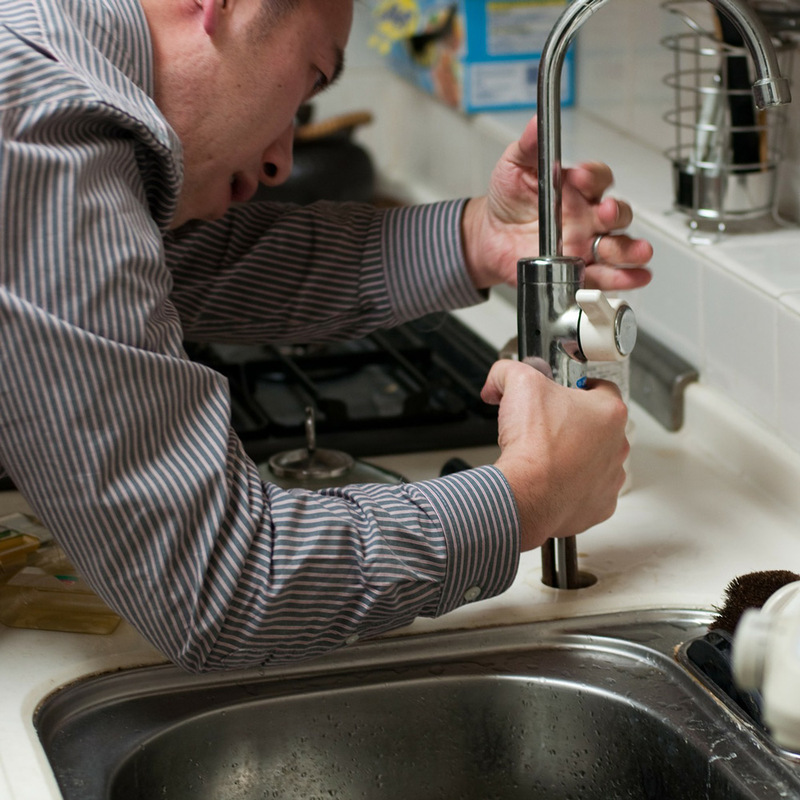 Hence I suggested that a new tile dedicated to Appliance Delivery should be created. I utilized the same UI patterns to that of the rest of the tiles, with a balanced harmony throughout. I designed the calendar widget to ease the user in selecting a date in an efficient manner, using different treatments for current and selected dates. I used different typographical treatments to highlight the extra delivery information for each item in the cart section on the right. The desktop viewport of this scenario can be seen below. Due to the tight timeline and using my interaction/UX design knowledge, I quickly created responsive high fidelity mocks that outlined the flow/experience the user would take to fulfill this task. The animated high fidelity prototype below only showcases the desktop viewport for demonstration purposes. I came up with a streamlined, efficient task flow, with the "Save & Continue" CTA providing confirmation of the new entered address as well as progressing the user to the next step of the checkout experience. Once the new checkout went live, I wanted to see how the new experience was doing in terms of usability for users as well as to see if there are any opportunities for improvement. Some users had a difficult time progressing to the next step from the Payment Information as the fake credit card information that was provided did not go through. They were quite confused as to why the "CVV" text field did not appear. Some users wanted to change the store they were picking the item up from or shipping to and they could not figure out a way to perform this action, even though the functionality exists on the right hand side. Unfortunately they were going back to the main site and changing the store in the global navigation. As a result, I saw this as a great opportunity for an iteration. I designed a separate tile in the checkout flow, using the same UI patterns as others, specifically outlining the stores the customer has chosen previously to pick the items from. Each store information can also be seen in the cart section on the right, however I've used the Progressive Disclosure pattern to allow the user to view more details of his/her choosing since having an accordion within an accordion is not a good practice. In addition, I had to take another edge case scenario into consideration in that the option for an alternate pick-up person needs to be featured as well. I merged both features into one tile to provide a seamless experience as seen below. 3. From the usability tests, I was able to able to gather some metrics in regards to the time each individual takes to checkout an item from start to finish. When the new checkout experience went live, there was a tremendous increase in conversions especially in the mobile space. French speaking customers also played a huge role as well. As I am not allowed to disclose exact numbers for confidentiality reasons, I've represented it visually to provide a general idea. As seen in the usability tests, most users found it very easy to use and was able to checkout their items in a much shorter time frame than the previous iteration. The Desktop experience still needs to be looked at to aid in increasing conversions and usability. © Pasan Dangalle 2018. All Rights Reserved.